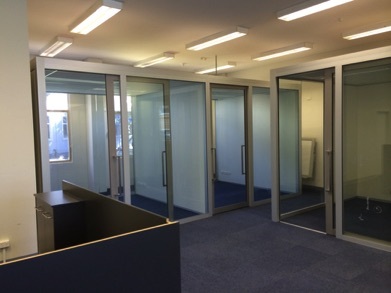 GBCA - Green Star Points for demountable partitions and premier office glazing systems. Pavillion is a height adjustable demountable & relocatable stand alone partition system incorporating Panelwall solid walls and Panelwall forward glazed framing with sliding doors and excellent acoustics with a suspended tile ceiling as standard or customised to your needs. Pavillion can cope with project floor to ceiling height deviations of up to 40mm. This system is ideal for high churn tenancies and buildings that make a standard office ceiling impractical. 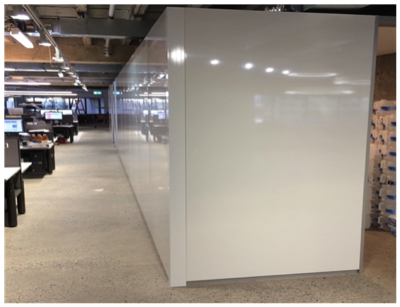 The panelwall demountable walls can incorporate flush fitted whiteboards and pin boards and power/data panels.